October 14th in Social Media, Wordpress Plugins by Wordpress Jedi . 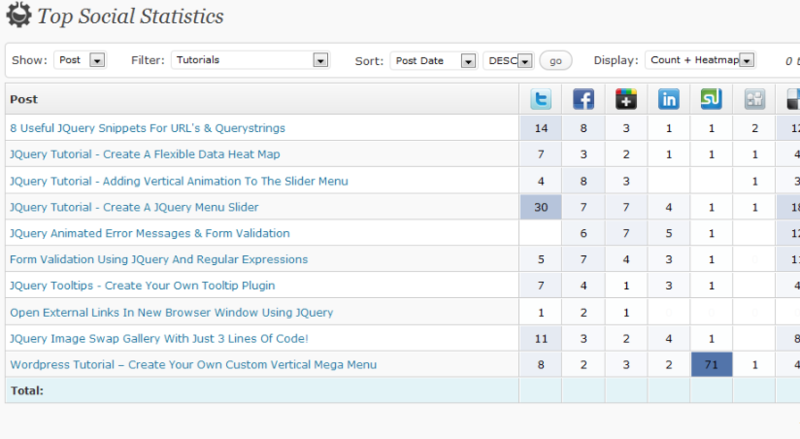 Social Sharing Analytics: displays social sharing counts of your blog posts in the admin panel. Top Social Share Posts: keeps track of your top social posts and lets you display them in your sidebar or with a short-code. Slick Social Share Buttons: adds Facebook, Twitter, Reddit, Google+, and other social buttons to your website (in two styles: floating and sliding tab). It keeps track of your stats too. Social Metrics: a social media analytics tool that tracks how is your content shared on Twitter, Facebook, and other sites. It shows the performance of all your posts and pages. Use this to find out which one of your posts have gone viral. 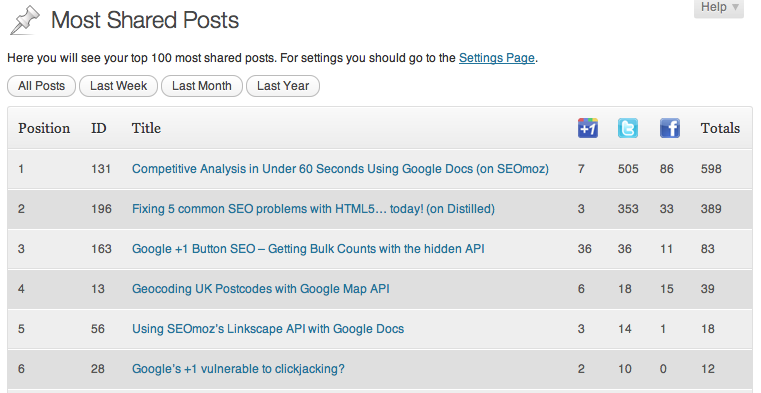 Most Shared Posts: want to show your top posts in your sidebar (based on your social stats)? This social media counter makes that possible. It shows Twitter, Facebook, and Google+ stats. 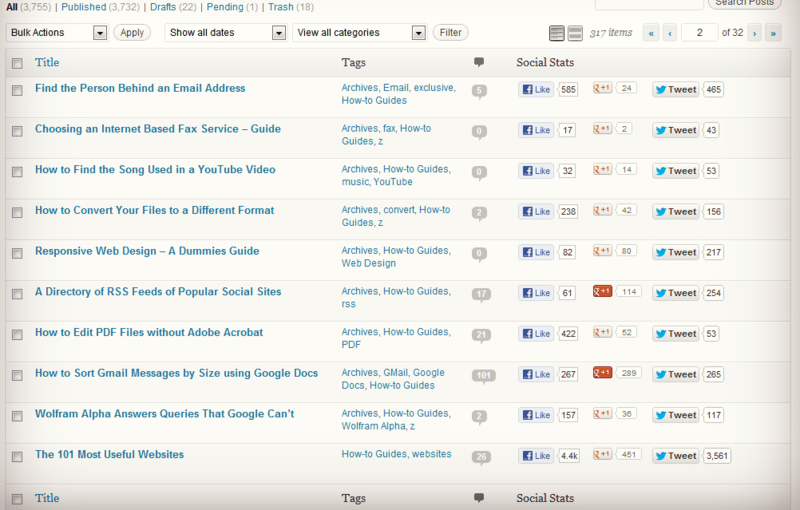 You could always use Google Analytics and other similar tools to delve deeper into your social data. 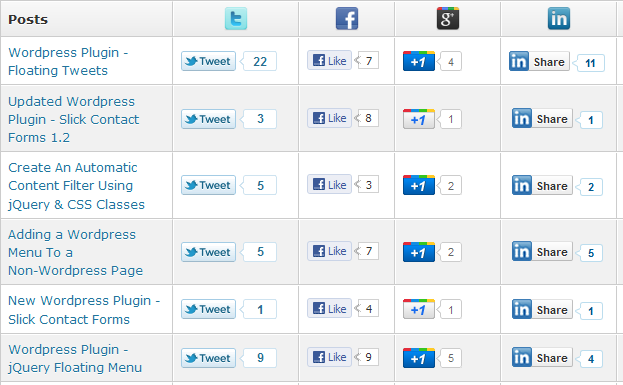 The above plugins are more than decent enough if you need a social counter. Next post: What WordPress Theme Is That? This Tool Shows You!